Whether it is India, Canada, France, the US or any part of the world, the use of glyphosate is all-pervading. In the US, over 4,000 lawsuits have been filed against Monsanto, the company which manufactured this herbicide. The first case, being heard in a court in San Francisco at present, is of DeWayne Johnson, a 46-year-old groundskeeper. He says the company failed to warn him of the dangers of using glyphosate, and as a result, he is suffering from a terminal cancer. But despite the well known health effects of using glyphosate, not all farmers are willing to give up the chemical. 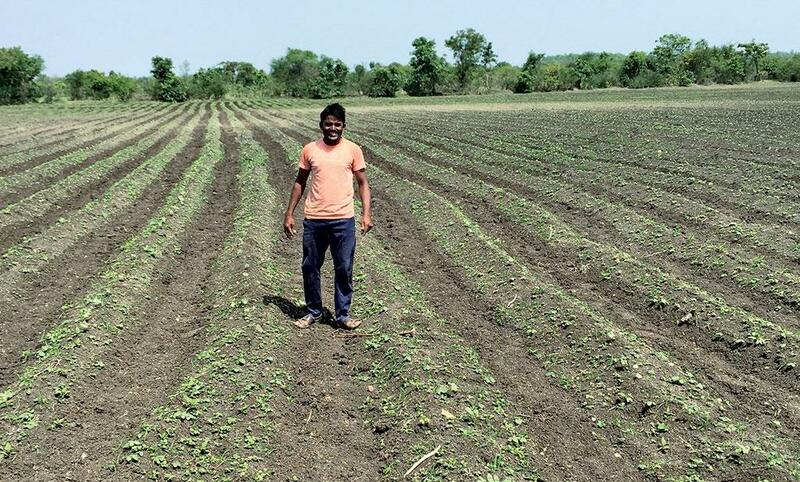 “I cannot farm without glyphosate,” says 40-year-old Vasudeo Rathod of Yavatmal district in Maharashtra, a major cotton and soybean growing area. He prefers to use this herbicide over manual weeding, which, he says, is very expensive. Costs can go up by as much as three times. This fastest growing herbicide was acquired by German pharma Bayer from Monsanto on June 7 this year. The chemical helps farmers to clear weeds growing in their fields. It is also used to clear railway tracks, parks and waterbodies of wild growth of plants. In many countries, glyphosate is used as a pre-harvest desiccant. It is sprayed on a standing crop to ease harvesting. Little wonder then that glyphosate sales have been rising. As much as 8.6 billion kg of glyphosate have been used globally since it was introduced in 1974, says a paper published in Environmental Sciences Europe in February, 2016. Globally, total use rose from about 51 million kg in 1995 to about 750 million kg in 2014, a nearly 15-fold jump. This increase is linked to introduction of herbicide tolerent genetically modified crops. It is not surprising why farmers love this herbicide. For instance, weeds can reduce tea yields by up to 70 per cent. In India, about 0.866 million kg of glyphosate was sold in 2014-15, according to the Directorate of Plant Protection, Quarantine and Storage. The usage would be higher now as herbicide tolerant genetically modified crops have made inroads across India illegally. Ajay Yerawar, owner of Ajay Krishi Kendra in Yavatmal, says that he personally sold nearly 300 litres last year. There are dozens of formulations in India that contain this chemical. However, Roundup® is the most popular product. According to Monsanto’s annual report, sales in 2016-17 increased by about 9 per cent from 2015-16. According to the 2016 report of the Federation of Indian Chambers of Commerce & Industry, herbicides are the fastest growing agrochemical segment in India with a market share of 16 per cent. When Down To Earth asked for information on the current sales of the chemical in the country, Monsanto’s India office said that they could not share the information and the Central Insecticide Board and Registration Committee (CIB&RC) too did not respond to mails or phone calls. “Measures to restrict the use of glyphosate will not work because its entry into cotton fields has piggybacked on BG-III seeds. 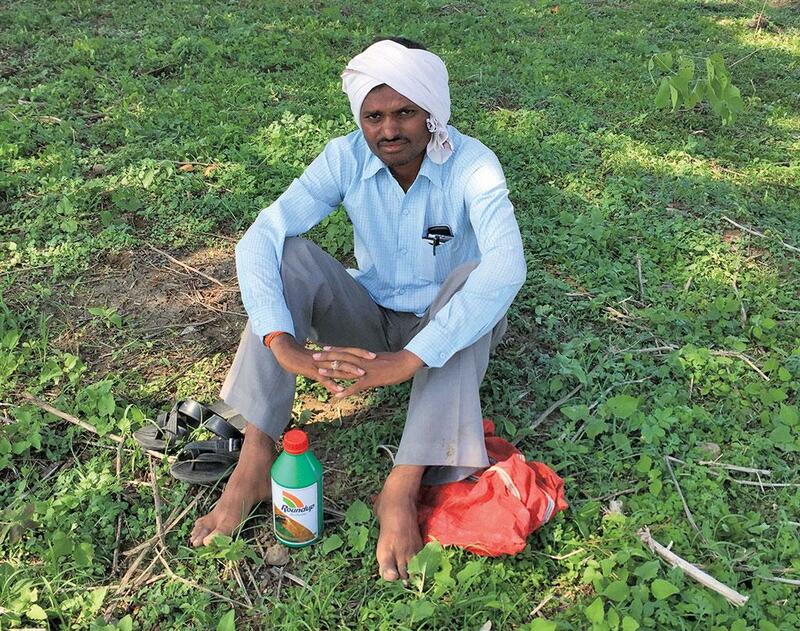 BG-III and glyphosate go in tandem for farmers,” says D Narasimha Reddy, director of Pesticide Action Network India (PAN), a coalition against pesticides. Adverse impacts of glyphosate include acute poisoning, kidney and liver damage, changes in gut microflora, cancer, endocrine disruption, neurological damage and immune system dysfunction. Worse, glyphosate formulations have been found to be more harmful that glyphosate. For example, polyethoxylated tallow amine (POEA) used by Monsanto as an adjuvant to increase the efficacy of glyphosate has been found to be 3,450 times more toxic to human embryonic kidney cells than the herbicide itself. The formulations also had toxins like arsenic, chromium, cobalt, lead and nickel, according to a study published in Toxicology Reports in December, 2017. The adjuvants are not regulated. “Glyphosate should be banned immediately because there is a huge fraud in the declaration of the active ingredient. Heavy metals, especially arsenic, are associated with glyphosate as formulants, but they have not been declared as active principles. Thus, they are the hidden, undisclosed poisons,” says Gilles-Eric Séralini, a molecular biologist at the University of Caen Normandy, France, who has worked extensively on genetically modified crops and their health effects. The tangled web of glyphosate has ignited a global debate over its use. Though the chemical was synthesised in 1950—when a scientist was looking to develop a new drug—it was only in 1970 that its herbicidal action was identified. Monsanto introduced the product in the markets in 1974. At that time the US Environmental Protection Agency (USEPA), established in 1970, was still setting up procedures for standards. Monsanto could easily exploit the gaps in the procedures. The 290-odd studies, reports, memos and letters that USEPA used to register glyphosate were generated or submitted by Monsanto. These reports were neither published nor peer reviewed. Many of these documents are still not available for review by the public or scientists as the company claims these are trade secrets. Carey Gillam, author of Whitewash: The Story of a Weed Killer, Cancer and the Corruption of Science, says Monsanto’s research on glyphosate is highly suspect. For example, research fraud was discovered at two of the laboratories the company used regularly. In one of these labs, Industrial Bio-Test Laboratories, researchers would substitute dead or sick animals with new ones, but did not indicate this in their lab reports. There were also instances where false data was submitted if test results were not what the company wanted. Over the years, Monsanto has spent millions to protect its product. It paid scientists to conduct studies to show it was safe. It sponsored experts who would counter if a paper or article suggested that it was unsafe and got ghost written articles in names of prominent scientists. This manipulated data blotted USEPA’s own assessment in 1985 that said that the chemical was a carcinogen. In March 2015, the International Agency for Research on Cancer (IARC), an agency under the World Health Organization (WHO), labelled it “probably carcinogenic” and found that it has links with non-Hodgkin’s lymphoma. This too has been countered by the company which called the global body’s assessment as “junk science”. 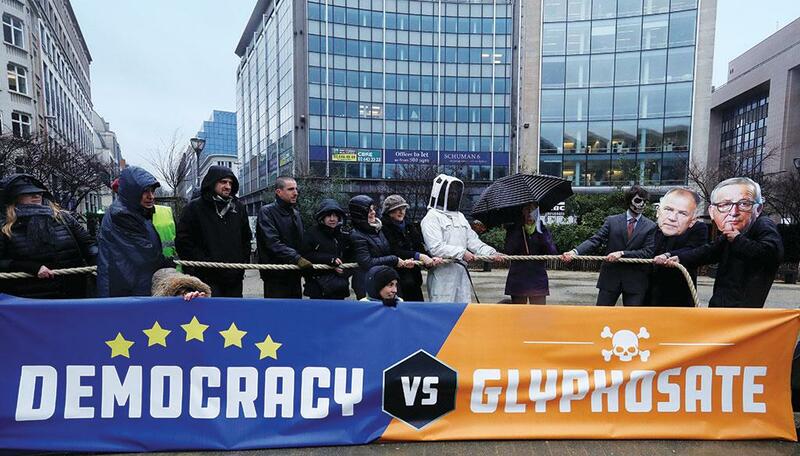 In 2016, after intense lobbying, the industry managed to get a joint committe comprising members from the WHO and the Food and Agricultural Organization to say that “glyphosate is unlikely to pose a carcinogenic risk to humans from exposure through diet”. However, IARC updated its review in 2017 and has still classified the chemical as a carcinogen. But countries are finding it difficult to ban the chemical because of pressure from industry and farmers. Sri Lanka was the first country to ban the chemical in 2014 after a study linked it to chronic kidney disease, prevalent in many parts of the country. This study showed a link between diseased rice farmers and use of Roundup®. Researchers said that the chemical reacted with cadmium and arsenic in groundwater to become more toxic. However, the ban was lifted in June 2018 due to pressure from tea plantation owners who said the ban had led to crop losses worth more than US $157 million. In Thailand too, farmers and agriculture industry leaders have asked the government not to restrict its use. Here, it is used in plantation crops like oil palm, rubber and tropical fruits. They claimed that use of glyphosate allowed them to farm without tillage. This had environmental benefits such as less soil erosion, high water retention and reduced carbon dioxide emissions. Farmers threatened to shift to tillage if they were denied glyphosate. An example of how business interests can shape policy is evident from the wobbly stand of the European Union (EU). On November 27, 2017, the EU voted to take a decision on whether licence for glyphosate should be renewed or not—18 countries backed the proposal, nine countries were against and one abstained. This allowed for the European Commission (EC) to renew the licence for another 5 years. Not surprisingly, Germany voted in favour of the chemical to protect Bayer’s business interests (see map: ‘Baby steps’). After buying Monsanto for US $62.5 billion, Bayer has decided to ditch Mon-santo’s name. Industry observers say that this is to avoid future association with a company that has often been labelled as the world’s most vilified company. And rightly so. The company’s history is mired with controversial products such as polychlorinated biphenyls, a persistent organic pollutant that causes cancer, Agent Orange, a defoliant used in the Vietnam war that was linked to genetic defects in children, and aspartame, an artificial sweetener that is carcinogenic. Moreover, Monsanto’s genetically modified seeds have destroyed natural farming systems across the world. In November 2017, Argentina tried to ban glyphosate, but within two weeks, the company stepped in to get the ban process revoked. The company argued that the EU had agreed to renew the licence for the herbicide for five years proving it was safe. So a new municipal bill was drafted, which authorises spraying with certain precautions. “We consider it deplorable that the councilors reversed the commendable decision to protect the health and environment, yielding to pressure from the soy lobby,” said a group of more than 10 environmental and social organisations in the country. Body of evidence Evidence nailing glyphosate is pouring in. Researchers at the University of California San Diego School of Medicine say that exposure to glyphosate has increased about 500 per cent since the introduction of genetically modified crops. The researchers compared the levels of glyphosate in urine samples over a 23-year period, starting in 1993, just before the introduction of genetically modified crops into the US. The findings were published in the JAMA on October 24, 2017. These residues have adverse health effects as seen in Argentina. A study published in Journal of Environmental Protection in April 2018 says that in areas where GM soy is cultivated, miscarriages were three times the national average and birth defects were two times the national average. On March 9, 2018, a study published in Environmental Health revealed that exposure to glyphosate resulted in shortened pregnancy length which is detrimental to the child’s health. The research found that 93 per cent of a group of pregnant women in Central Indiana in the US had detectable levels of glyphosate in their urine. Researchers found that the glyphosate levels correlated significantly with shortened pregnancy lengths. Such studies that capture the health effects of glyposate are missing in India. Of late, some efforts have been made to curtail the use of this chemicals in India. On March 26, 2018, the agriculture office of Yavatmal district wrote to the director, quality control, Pune, asking for restrictions on glyphosate pointing out that as Yavatmal did not have tea gardens or non-crop areas, the use of the chemical was illegal. “We do not want the harmful chemical in our jurisdiction,” says Kailas Wankhede, sub divisional agriculture officer, Yavatmal. For about two months the sale of the chemical was curtailed in Yavatmal. The farmers who wanted it, however, could procure it from the neighbouring districts. Due to the demand, the restrictions could not be enforced. “Krishi kendras, local shops that sell agro products, have asked for a licence and we could not refuse permission,” says N M Kolapkar, district superintendent, agricultural officer, Yavatmal. Moreover, district agriculture departments do not have the authority to restrict the sale of agrochemicals. Even state governments cannot ban the sale, distribution or use of pesticides beyond 60 days, according to Section 27 of the Insecticides Act, 1968. The decision to ban the sale and use of agrochemicals can be taken only by the CIB&RC, which comes under the Union Ministry of Agriculture and Farmer’s Welfare. Other than Maharashtra, Andhra Pradesh too has curtailed its use. They are not alone in the fight against glyphosate. In October 2017, the Alliance for Sustainable & Holistic Agriculture (ASHA), a network of agricultural organisations had petitioned the Union Ministry of Agriculture and Farmer’s Welfare to ban the chemical. “It should be banned as none of the farmers use the recommended personal protective gear and equipment mandatorily required to be used,” says Dileep Kumar, programme coordinator of PAN. Manish B Shrigiriwas, dean of Vasantrao Naik Government Medical College, Yavatmal, also recommends a ban. “Glyphosate should not be used as there is no antidote for it,” he argues. However, this is not going to be easy. When Sachindra Pratap Singh, agriculture commissioner of Pune was preparing a report to be sent to the Central government to take action against glyphosate, he could not find research in India to support a ban. There are ways state governments can get a pesticide banned. For instance, the Nagpur bench of the Bombay High Court on February 22, 2018—while hearing a public interest petition filed by Jammu Anand, a social activist based in Nagpur—on compensation for farmers who died after inhaling pesticides, asked the Maharashtra government to communicate with the Union government to ban pesticides. But this may not solve the problems that the farmer is facing. “The authorities do not understand the ground realities. The farmers are using it only to make ends meet. Banning it without offering any alternative would further aggravate farm distress,” says Vijay Jawandhia, founding member of Shetkari Sanghatana, a network of farmer organisations. As government agencies to promote safe use of chemicals are missing, farmers like Nana Nitnawre of Tekadi village are forced to take the advice of agrochemical dealers. “We are indebted to the dealer, we use whatever he gives us,” says Nitnawre. Gajanan Divekar of Waghapur village in Yavatmal district suggests that the crisis can be averted if the farmers get a fair price for their produce. Farmers are even ready to switch to organic farming if they are assured of higher prices, he says. Jawandhia recommends that weeding could be included in the farm work approved under the Mahatma Gandhi National Rural Employment Guarantee Act. Kavitha Kuruganti of ASHA says that instead of glyphosate, traditional weed management systems should be used which promotes weeds that are useful as food and fodder (see ‘Collapsing ecosystems’). Despite the fact that chemical residues are present in food, the Indian consumer has not come into the picture so far. They have not demanded glyphosate-free food, even though there is enough evidence of its presence in foods. Santanu Mitra, author of Poison Foods of North America, says, “About half of all yellow peas (matar) and red lentils (masur) consumed in India come from Canada. About 93 per cent of yellow peas and 75 per cent of red lentils from Canada had glyphosate residues of 199 and 485 parts per billion (ppb). Green gram (mung) from Australia had a shocking glyphosate residue of 1,500 ppb.” India imports large quantities of pulses from both Canada and Australia. In fact, Canada’s food regulator found traces of glyphosate in nearly 30 per cent of about 3,200 food products it tested. In the US, though independent studies have shown that food products had glyphosate residue, the government is trying to hide the fact. When the US Food and Drug Agriculture Administration (USFDA) released its study in 2017, it did not report any violation of glyphosate residue standards. Internal correspondence, however, shows that the USFDA researchers too had found nearly every food contaminated while they were validating the testing methods. But since these were not the official samples but samples the researchers brought from home, the USFDA higher-ups decided to ignore the findings. These test results are now part of the hearing in the San Francisco case mentioned earlier. In India, a draft notification was released on December 27, 2017 proposing Maximum Residues Limit for glyphosate—it has been set at 1 mg per kg, 0.01 mg per kg and 0.05 mg per kg for tea, rice, meat and meat products respectively. Though the proposed standards are in sync with global benchmarks, unless India sets limits for everything, the consumer would be susceptible to contamination, including from imported food. We also need facilities to test for the presence of the residues. The final notification is yet to be issued. “It is time for a new scheme for pesticide evaluation in which regulatory decision-making takes into account not only the technical evidence on safety but also the societal context in which decisions are made,” say Nico M van Straalen from Vrije Universiteit Amsterdam and Juliette Legler from Institute for Risk Assessment Sciences, Utrecht University, the Netherlands, in an article in Science in May 2018. In the interest of the health of the farmer as well as the consumer, the Union government must get serious on this toxic chemical. As of now, there seems little hope in the offing. In the US, DeWayne Johnson wants the chemical banned. So does Mangala Madavi, a resident of Kalamb tehsil in Yavatmal district. Her husband was one of the victims of the inhalation deaths last year. The special investigation team set up by the government last year gave a clean chit to the chemical manufacturers putting the blame squarely on the farmers. Mangla differs. “It is the fault of the companies. They are making bad products,” she says. Last year, when her husband passed away, the other labourers stopped spraying for some time. But they had no option. “We have to see what happens this year when the rains make conditions perfect for the weeds,” she adds. Other than human health, glyphosate also messes up with the environment and the organisms that keep it healthy. Studies show the chemical significantly decreased the activity of fungi which is crucial in the ability of the plant to absorb water and nutrients from the soil. Exposure to the chemical leads to reduction in beneficial microbes in soil. Moreover, friendly organisms such as earthworms are also affected when glyphosate is used says a study published in Scientific Reports in July, 2014. The report found that the earthworms in the study area were fatter and less active. The herbicide is also a chelating agent and binds to nutrients present in the soil and making them unavailable to the plant, says a study published in Environmental Science and Pollution Research in January, 2018. Continuous use over the years has led to herbicide resistance in weeds and the development of superweeds. Resistance was first seen in1996 in a weed called Lolium rigidum in an apple orchard in Australia. An assessment published in the Pest Management Science in October 2017 shows that since then 38 weed species have become resistant to glyphosate. These weeds are distributed across 37 countries and in 34 different crops and six non-crop situations. Many of these weeds have been found in fields where glyphosate resistant crops are being cultivated. According to a study published in the Journal of Experimental Biology in July 2014, food security is being threatened due to the use of Roundup. The study shows that even small doses of the chemical harms bees which are crucial for pollination. The researchers from the University of Buenos Aires in Argentina found that honeybees exposed to Roundup exhibited decreased sensitivity to sucrose leading to a decreased ability to track and find food. Bees exposed to glyphosate also exhibited poorer learning performance, a decreased ability to smell and poor memory. They also exhibited higher frequencies of Colony Collapse Disorder most likely because they could not remember how to get back to their hive. (This story was first published in the 16-31st July issue of Down To Earth under the headline 'The real weed').